Unfortunately, I find the eXplorists very difficult to use. The instruction manual is difficult to read and you would think with all the power that the device offers it would be an outstanding little unit but it's not. It's accuracy stinks, doesn't hold track in dense cover and from what I have seen so far, the only way it has a modicum of success is to hold it horizontal with the ground plane. I am a mountain biker and the only way to do that is to mount it on the handlebars or the stem and that is a no win situation because even the mount is very ungainly. You probably don't want to hear this either, but a few of my friends have some different versions of you Trillion series - I was tempted to get one of those but after hearing their horror stories with the bugginess of those units, I am not. My next GPS purchase will most likely be another Garmin. I have two already. Also, I recently downloaded your free software that interfaces to the unit but found that it doesn't offer me much. I can look at tracks, when I can get the interface to work, which seems like once in a million times, and then so what. I can't edit tracks - can't do anything with it. Again, Garmin has you beat there, too. If you would like to contact me directly, feel free to email me at eatsleepfish [ at ] gmail dot com. I would be happy to discuss your products further. I really thought the eXplorist was going to be a good alternative to my GPSMAP60 but it performs just about the same, if not worse at times. Seems the most accuracy with the unit is achieved by keeping it horizontal, which is a tall order for a mountain biker. That would mean mounting somewhere on the stem or the bars but I have broken enough of my Garmin mounts to know even that is not a safe place for a GPS mount. eXplorist posts. My MAP60 isn't all that great, either, in comparison to the Garmin Edge, of course. Not sure if anyone has anything comparable at this point. In that ride at Trumbull, the Map60 outperformed the eXplorist by holding track much better. As you can see they are pretty evenly matched. The blips are when I took the pack off and it swung one way or the other. I have seen that alot, but you can see where there is a big red line and that means the eXplorist lost track. I suppose to give these two units a really fair shake I need to run them side by side and I might give that a shot by doing the entire Larkin State Bridal Trail on my fixie. 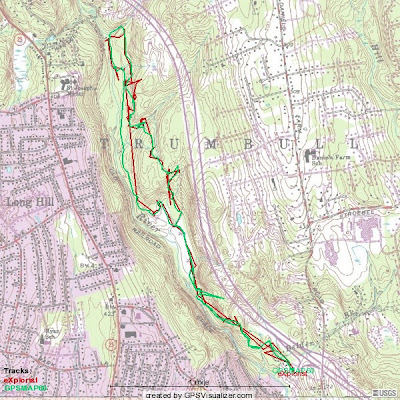 I was driving through Southbury yesterday and was able to get a good look at the northern section of the trail and it looks a little rougher compared to the rest of the trail. In fact, I might have to run all three to get the most accurate comparison. I will have dig up the posts from last year where I have used the eXplorist. Just have to finish tagging all my old posts. Hopefully some honest feedback will get them to improve their product lines.